Like the stamp? I made it meself! :) Whether you saw it once or over a hundred times, you are visiting this site not only to gain information on the movie, but because you LOVE it! My first viewing happened way back in 1986. I must have seen it at least three times in the theater with various family members, enjoying each viewing more than the last. Sadly, it would take twenty years, four months and another full viewing to rediscover my love for the film, and it arrived on Thanksgiving Day in 2006. I rented the film to watch it over. 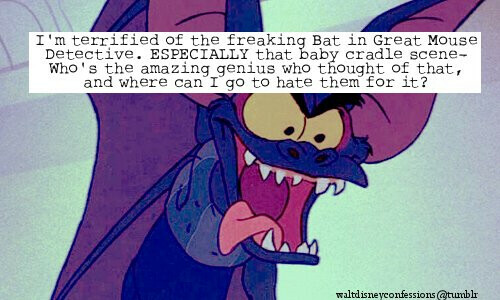 Yes, it's very pathetic I didn't even have my own copy of it on VHS! 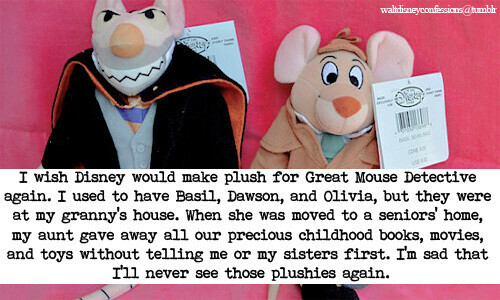 I saw the commercials in the 90's and I never once considered buying it! 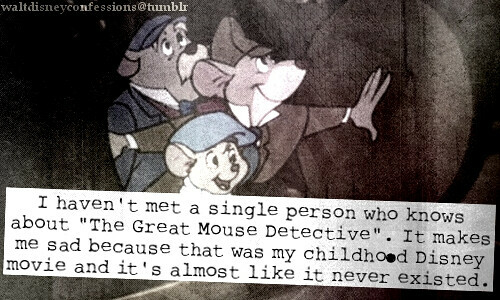 To make a long story short, I fell in love with it all over again! 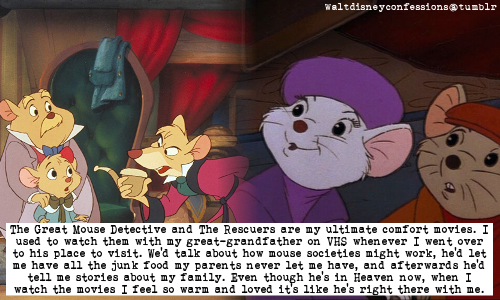 Since that time, I've drawn art, created a fictional story (with more in the works), made new friends, and even had the pleasure of meeting Basil's voice actor, Barrie Ingham! 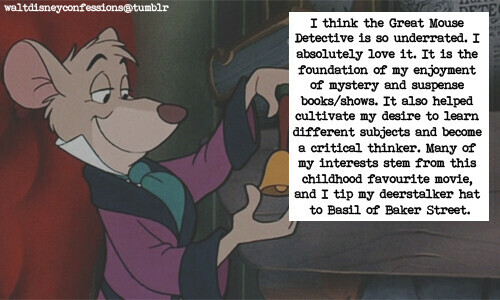 To give the film the much-needed attention it deserves, I wear a Basil pin on my backpack purse. I've gotten quite a bit of a reaction from the pin, including Barrie himself who spotted it right away! To put it bluntly, this page is reserved for those who want to share their experiences with the film. When was the first time you saw it? Was it in the theater or in your own private home? 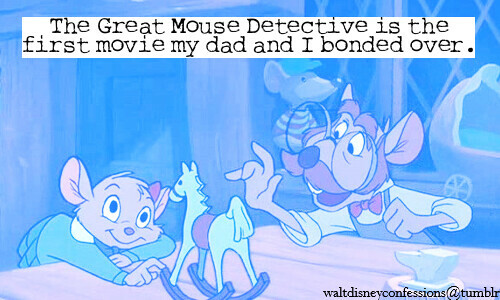 What made you sit and realize you loved it to the point of adding it to your list of favorite movies? If you have a memorable story to tell, Send it to me and I'll add it here for others to read! 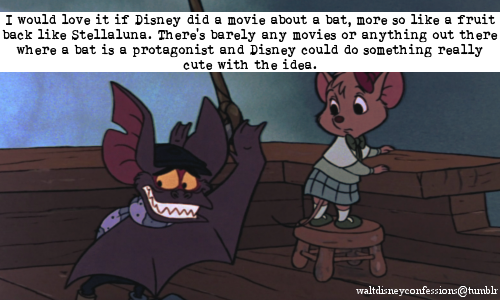 Part 1:"The Black Cauldron" was to be a return of greatness for Disney Feature animation. 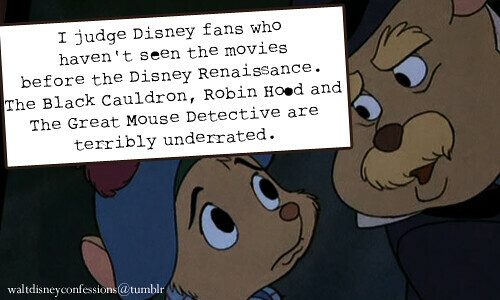 There was a lot of fresh new talent alongside veteran Disney artists to bring it to the screen. Somewhere along the way as it slowly creeped through production, I just found it difficult to get excited about the direction Cauldron was taking. I wasn't as thrilled about it as I had been when I first saw Mel Shaw's dramatic pastels for the film. He had captured a tale of sweeping adventure and fantasy in brilliant colors. For me, that excitement had been watered down. 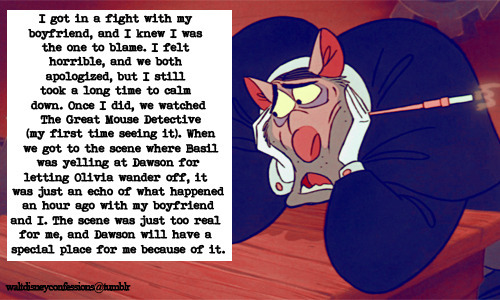 I wasn't alone. There were others too who wanted to work on something else. 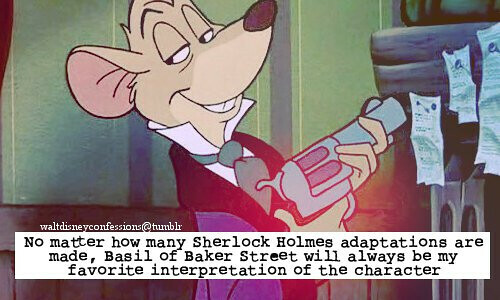 That something else became, "Basil of Baker Street." Mel Shaw had also been sketching pastels for a new film with the working title, "Basil of Baker Street." 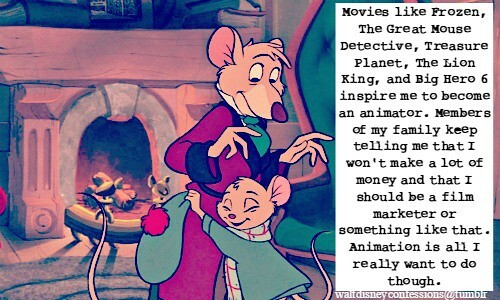 Among the early participants were Producer Burny Mattinson, Directors, John Musker, Ron Clements, Dave Michener, animator/character designer Ed Gombert and storyman Vance Gerry. Don Griffith provided some excellent visuals for the Dancehall/Waterfront dive area and I was moved over to likewise create some concepts. The group was dynamic to say the least. Burny could make these gorgeous charcoal story sketches with lots of appeal and he was an upbeat person to be around. I knew John from Cal Arts days and he was a mark above most even back then with a satirically sharp edge on his drawings. Ron had heart, plenty of it and really studied film techniques as in the 3 C's. Dave was a true veteran of Disney, working close with Milt Kahl for years, and his draughtsmanship was impeccable. Ed was a keen talent in many areas whether designing a character or executing a story sketch and I enjoyed his offbeat humor. Vance was just an easy going mellow soul who was fun to talk to and he could knock out beautiful story panels that nailed each moment in the story arc. 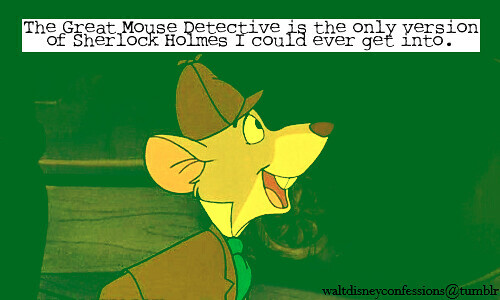 The story was based on a series of children's books by Eve Titus where a mouse fashioned after London's greatest detective lives just beneath that famous 221B Baker street address. 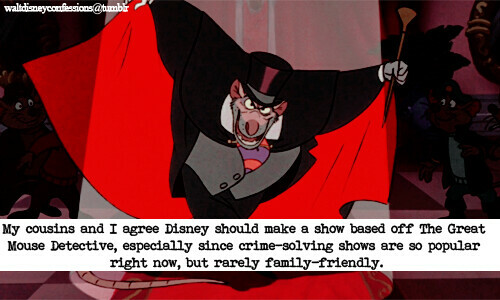 His archenemy is Professor Ratigan, a nod to Professor Moriarty from the Sherlock Holmes world. 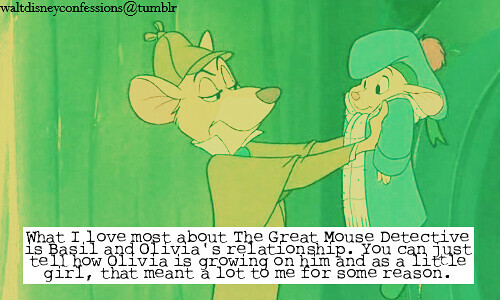 At one point the little girl, Olivia, was older and a possible love interest for Basil but it was decided a small girl searching for her father would gain more feeling between our leads in the story dynamic. 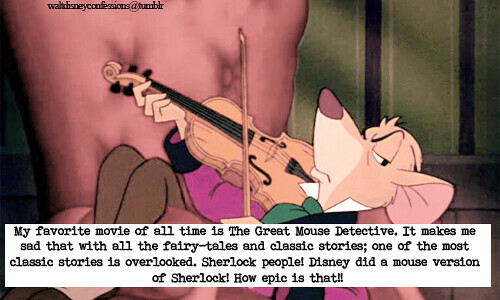 Basil also plays the violin quite well in our movie whereas in the books he's horrible with the instrument. 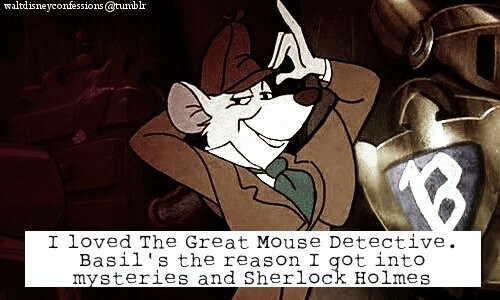 Basil was named in honor of Basil Rathbone who played the detective role famously for MGM and Universal studios for many years. Ken Anderson had done a marvelous workbook for "Ben and Me", and I was using copies of those as a guide to workbooking for Basil. The productions hadn't been using workbooks in their planning for many years. I'm guessing because the older crew with icons like Don Griffith and Mac Stewart and others had gained so much experience that they could just go from story sketch to layout with a minimum of problems. Well I wasn't as experienced or comfortable doing that so I liked relying on workbooks to aid in the staging process. I did all my thumbnails and even full size layouts in charcoal, sometimes using a carbon pencil for tight detail line work. I also made what I called "Color Ribbons" in small thumbnails to show the progression of color which is so important to setting mood and having an emotional impact. I got that idea from Fantasia, where they had these great little charts showing the abstract color in a sequence and how it would flow through the story. These were then set using workable fixative. In those days we were still in the original animation building where they had done everything from Pinocchio onward and thank goodness the windows could be opened. This way I wasn't asphyxiating myself or my crew mates although that fixative odor could really linger. 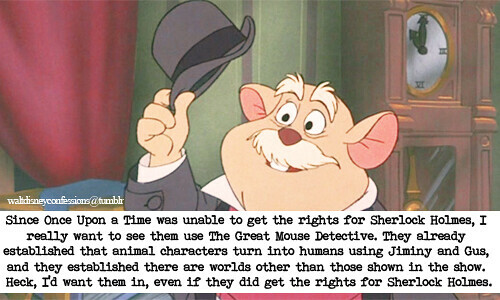 John Musker would routinely enter my room and ham up his gagging when he heard me spraying. HA, HA, HA, what a card, sheesh, hey I had to do something to make that stuff quit rubbing off! The sequences I was mainly responsible for designing were the opening title, Basil's flat (Basil's introduction), the Toyshop and the climactic fight (chase across sky onto and into Big Ben). 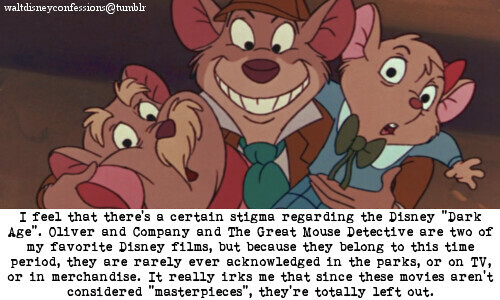 Gil Dicicco who was also an Art Director on Basil for a while and did Ratigan's Lair along with the final waterfront look with marvelous watercolor studies. He introduced me to using FW Inks which gave you these brilliant colors and had an excellent permanence in light. Sadly the FW formula changed from carbon to acrylic about 10 years ago and the colors are milky these days. 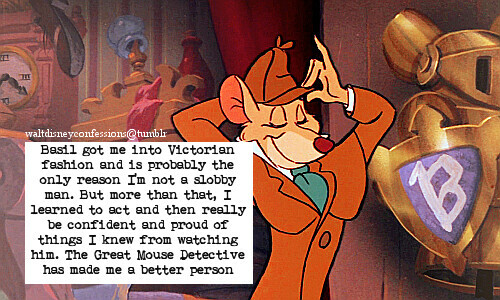 Brian Mcentee did Mr. Sherlock Holmes' flat upstairs and exterior streets of London with wonderful pastels. He did a series of those pastels set in the early morning just after my toyshop chase as Basil, Olivia and Dawson trot homeward on the back of bloodhound Toby while the lamplighter douses the gaslights one by one. Henry Mancini set music to them based on Big Ben's bell chimes and the total effect which brought tears to your eyes. 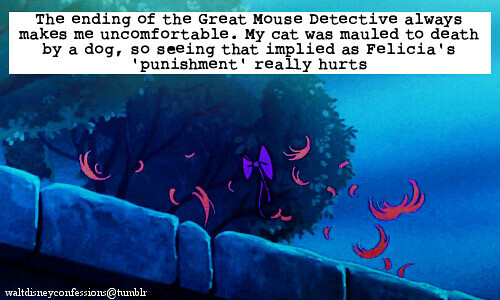 It had the potential of, "Feed the Birds" from "Mary Poppins", to my mind. 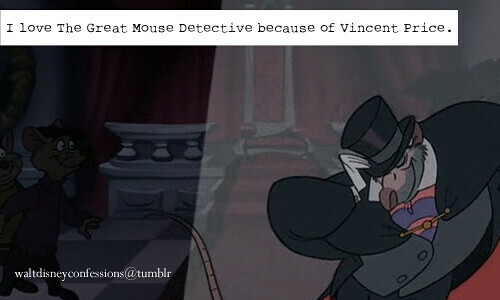 Unfortunately it was cut. It's a shame because the pacing gave us a heartfelt piece of emotion and a breather between two chase sequences and I really thought that helped the overall pacing. 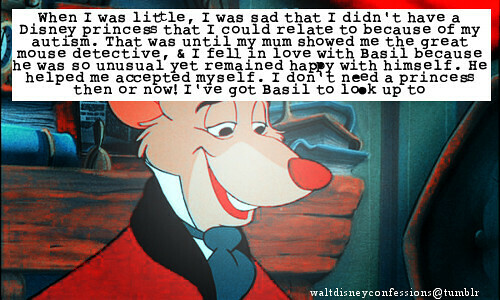 Barrie was a good ad libber. 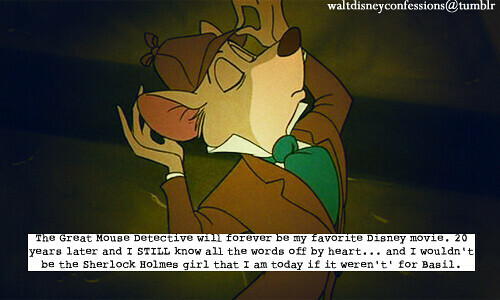 As I recall, the idea of him mispronouncing her name was our idea. 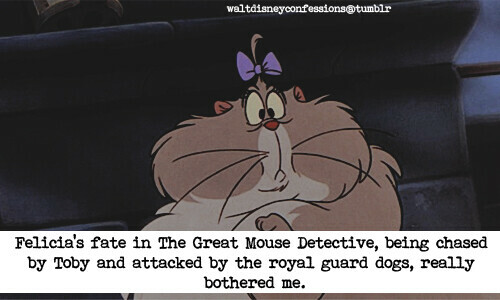 But the specific mess-ups were mostly his invention as I recollect. I specifically think "Flangerhanger" was one he came up with and that cracked us all up. It was also our direction that he mumble little fragments as his experiments play out but again, as I recall from 25 years ago, he invented a lot of the thrown away stuff he did for those moments. I know he did an elaborate improv that we really liked when he was making tea that we would end up not using for time's sake. It involved measuring teaspoons of tea where he would conclude, after counting out spoonfuls, "...and one for the pot..." which was based on the way they made tea in England where they would throw a last spoonful in with that remark. Barrie also had a metallic bracelet which literally could never come off so we had to tape it up when we'd record so it wouldn't jangle. He was a wonderful actor and very smart and funny and we really enjoyed working with him. 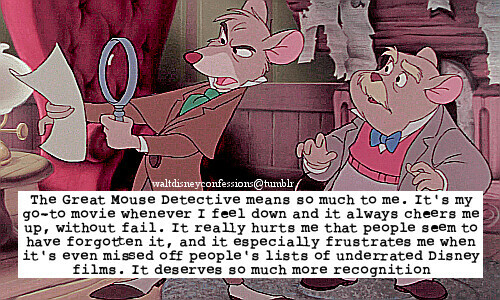 I remember watching The Great Mouse Detective all the time when I was young. 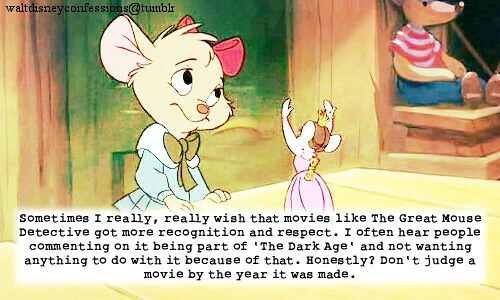 I loved everything about it, even though I was too young to fully understand it (I was about four). 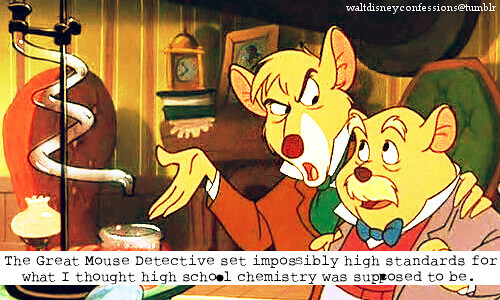 Then one day, the VHS tape we had wouldn't work anymore- my older siblings and I had quite literally watched it to death. Now, about fourteen years later, I walk home one night to hear the all-too familiar opening music, and the childhood memories came flooding back. 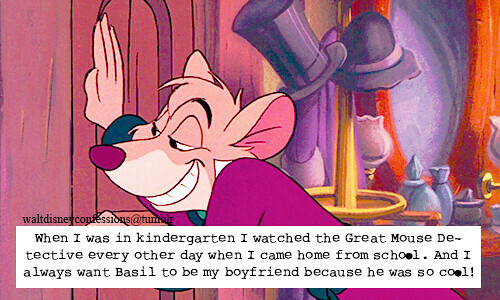 I watch it all the time with my younger sisters now- all three of us have a crush on Basil. Watching it now, I realize how much I had missed when I was a child; I see alcohol, knives, guns, and scantily clad dancers in a child's movie, and I wonder how on earth they got away with it (Not that I mind, of course). 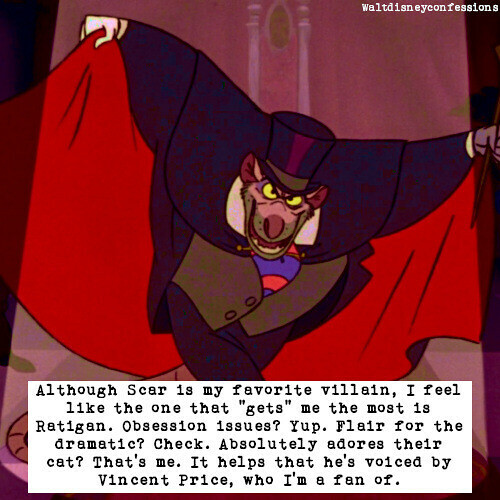 I also have a deeper love for the actors and their wonderful performances, especially Vincent Price. He knew how to mix murderous intentions with schoolgirlish glee and make it balance beautifully, giving us a truly funny and fun to watch villain. 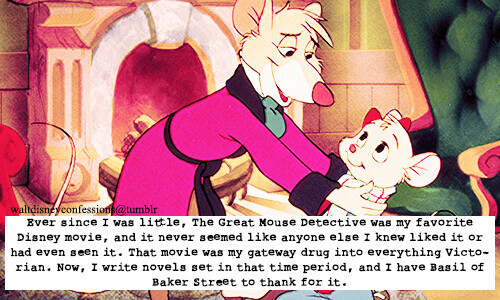 Title: "How I started my addictedness to The Great Mouse Detective"
December 14th 2005: Found an odd kid's book that must have been about The Great Mouse Detective. 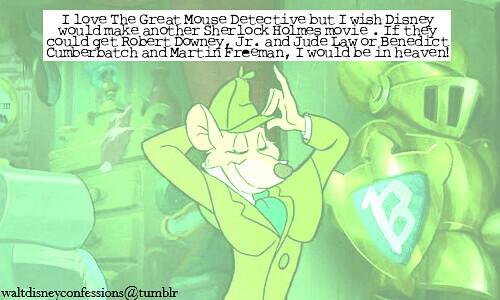 The only thing I can remember though from the book was Fidget. It wasn't mine though, it was in a classroom and it was before a winter concert I was part of. 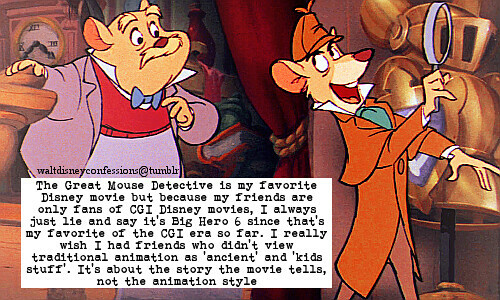 October 31st 2006: After going trick or treating, I went to watch some tv and I saw The Great Mouse Detective on!! 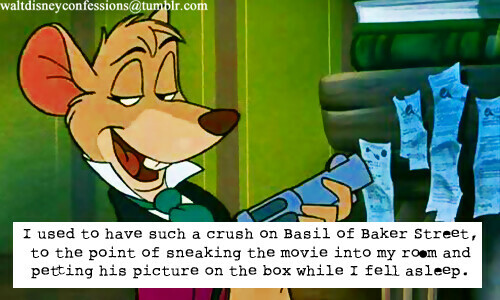 Sadly, I only got to see the part where Basil escapes from Ratigan's trap. 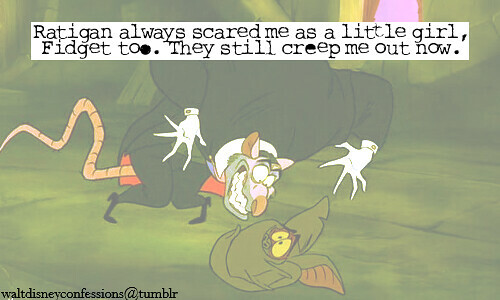 September 26th 2007: I saw some music videos with Ratigan and/or Basil in them and was wondering who they were. 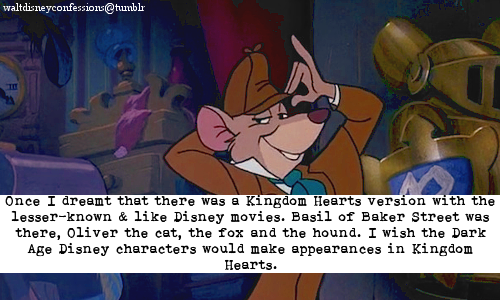 October 18th 2007: Finds out who Basil is, also I feel like I wanted to see the movie for myself. 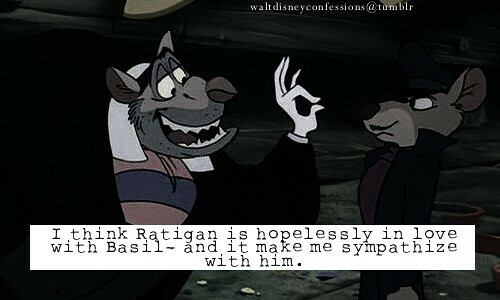 January 7th 2008: Finds out who Ratigan is, now I needed to see it.